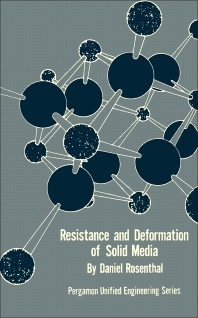 Resistance and Deformation of Solid Media is an introduction to the analysis of the resistance and deformation of solid media, specifically when they behave under the application of external loading. The book includes different concepts such as the elastic, plastic, and viscous properties of different solid materials; the basic principles of equilibrium of forces and movements; continuity and deformation; the homogenous, uniaxial, and biaxial states of strain and stress with different materials; structural and material instability; and fracture. Aimed not only for future structural engineers but also all future engineers, this book provides information on the mechanical behavior of solid media and prepares its readers to a more advanced unified field theory.